It was quite a precipitous day in my neck of the woods (South Florida, U.S.A.). Maybe, ‘Erika’, the tropical storm was informing me of the things to come. But, I didn’t allow her to distract me from the culinary plans that I had up my sleeves. I had ‘tunnel-vision’. I paid undivided attention to my ‘big boy’ (snapper fish) I had on hand. He needed me so I heeded to the call. I placed him on the cutting board and scored my marks upon his firm body. I smiled feeling like an artist as I drizzled a little olive oil within and out. I also sprinkled a pinch of salt and cracked black pepper in both the head and cavity. 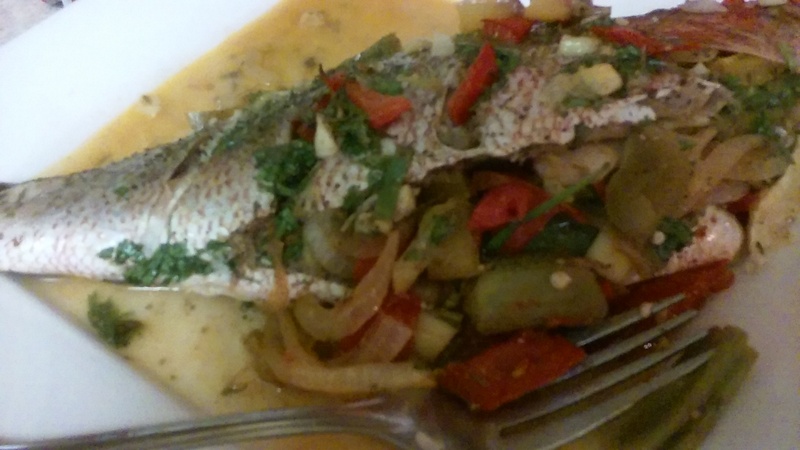 I love to cook whole fish over the fillet version as it retains all the succulent moisture. 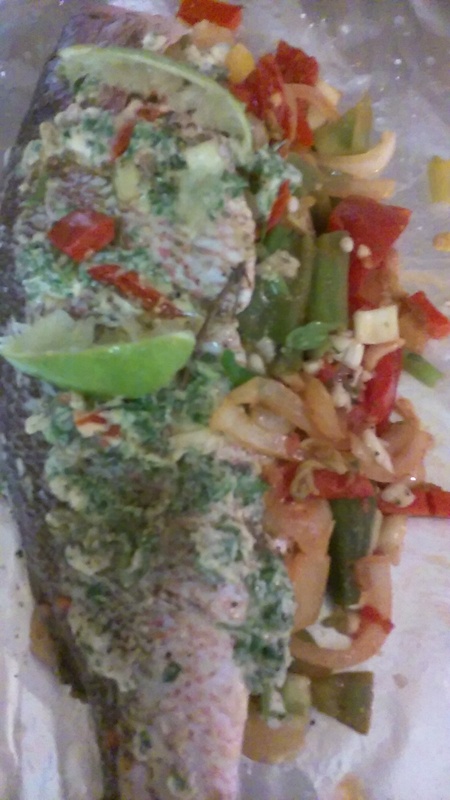 My plan was to make an oven roasted whole snapper fish with assorted vegetable stuffing. So, I grabbed my skillet and did a very quick saute of onions, bell peppers, tomatoes, vine-ripe tomatoes, crushed pimento and garlic, and some left-over chopped okra. I also added finely chopped scotch bonnet peppers along with thyme and scallion. I made sure to season along with salt and black pepper. 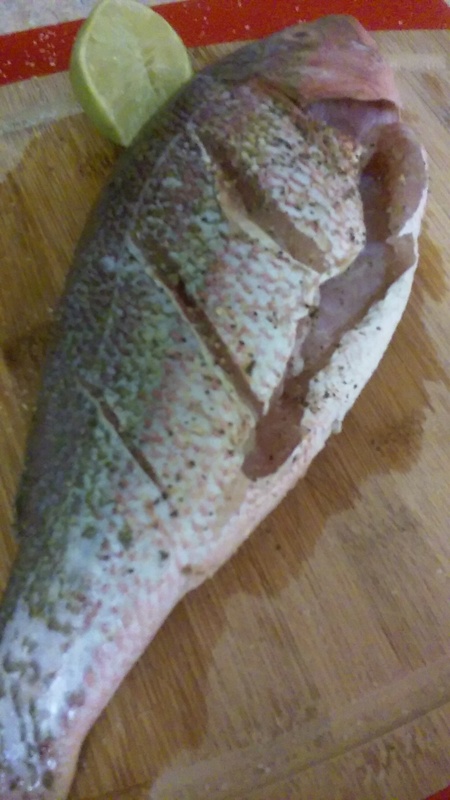 After the stuffing were cooled I added this to seasoned fish both inside the head as well as the body. Of course, I had extra stuffing and I placed same adjacent to my ‘big boy’. In addition, a table-spoon of herb-butter was added on same with a squeeze of fresh lime juice. 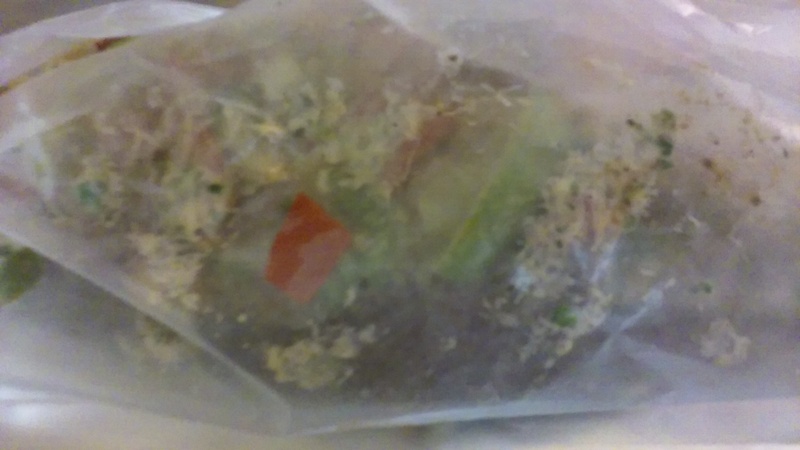 Fish was placed and wrapped in parchment paper in order to give a roasting effect. Foil was placed on top of baking sheet for any spillage of sauce. Whole snapper was placed in a pre-heated oven of 380 degrees fahrenheit for ten minutes. A few holes were poked on paper in order to allow steam to escape. After the ten minutes of roasting, parchment paper was unfolded and fish was basted with the aromatic juices released from the veggies. An additional ten minutes was given at 400 degrees. 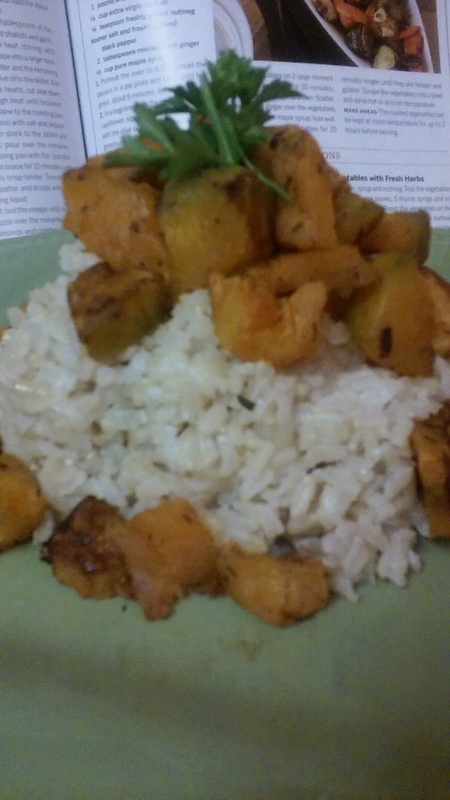 I served my snapper with steamed coconut rice and roasted pumpkin.